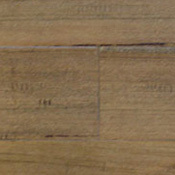 flooring make sure to learn all the pros and cons to Teak Hardwood Flooring. 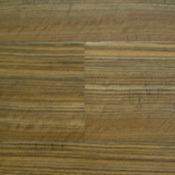 Teak is placed on the Janka Hardness Scale at 1000, but don't think it is not strong enough for residential use. 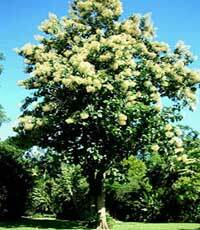 Teak excretes natural oils, so it is best used in exposed places because it doesn't need to be refinished. Thanks to Teak's many positive aspects, two out of the three species of Teak are endangered, so for all the environmentalists out there ask which types of Teak make the product. Teak Wood, thanks to its rotting resistance, can be installed in kitchens and even bathrooms (as long as your not sloshing around). Teak can even be installed outside, as long as its in a semi dry area. 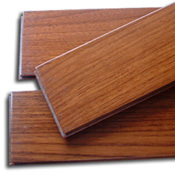 Teak is a great hardwood flooring option as long as you know its strengths and weaknesses. 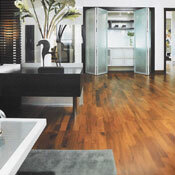 Teak is one of the few woods that can be installed any where in your home, just be careful about water. 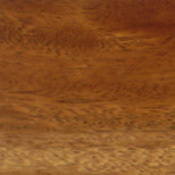 These are some Teak Products we offer.